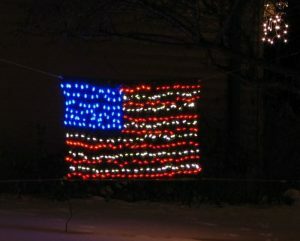 The finished LED flag in our 2007 display. 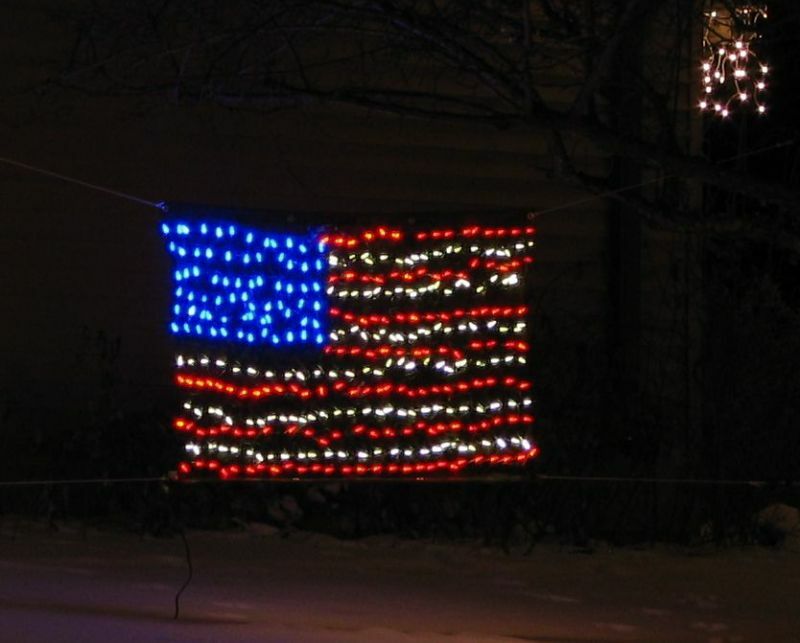 Back in 2001, and shortly after the 9/11 disasters, we created a flag out of lights for our display, to commemorate the lives lost in those tragedies, as well as those lives lost in the fight to end the threat of terrorism, and just as a show of support for our country in general. In 2002 the flag came with us to our current home and we used it in our displays through the 2006 season. But by then, the flag, which was made out of a net light, was showing its age– it didn’t look great anymore, and was getting hard to maintain. So we made the decision in 2007 to retire it. Not wanting to remove the flag from our display, however, we searched our creative juices for a replacement. Finally in November the idea came to Tim for how to create the new flag. 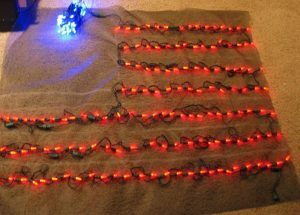 It would be made using nylon window screen as a backing material, using LED lights, which would give the flag vivid color, hopefully help make it more trouble-free than standard lights, and also provide energy savings. This picture shows the flag under construction. The red stripes are finished, and the blue is ready to go. Fortunately we had most of the materials on-hand. As luck would have it, we purchased some red and blue LED lights on clearance after the prior season. We also had a bit of window screen left over in the shed from repairs done at our old house. The only thing we had to buy specifically for this display was the white LED’s, and some wire ties. 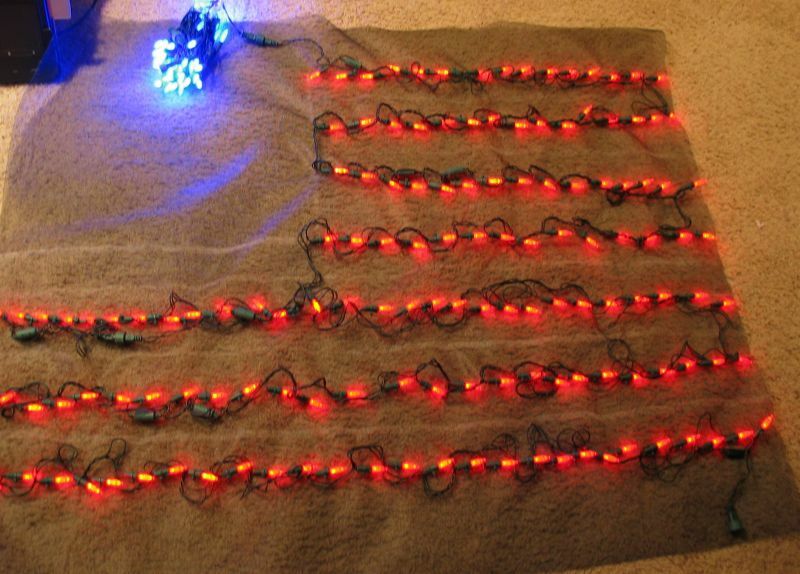 The flag is created out of 140 red, 140 white, and 70 blue LED’s, for a total of 350 lights. Each bulb is individually zip-tied to the window-screen backing, which was time-consuming and a bit hard on the fingers, but worked very well.